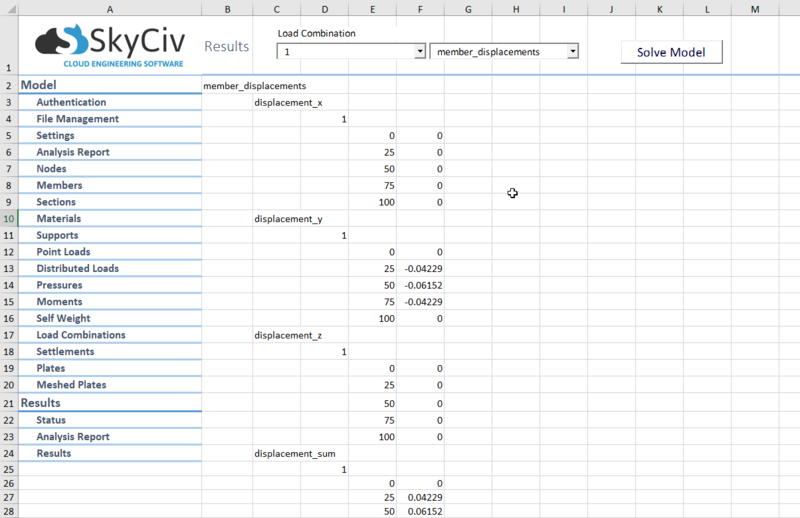 For those SkyCiv users who love using Excel, we’ve developed a template to solve your structural models using the SkyCiv API and Visual Basic for Excel! Take advantage of the power of SkyCiv's API without needing to code anything yourself. Build your model, solve it, review results and perform your own calculations all within Excel. Want to build your model in Excel and move it to SkyCiv, or see what it looks like with 3D graphics? No problem! When you click solve your model is automatically saved on your SkyCiv File Manager under Structural. This happens whenever you successfully solve your model, regardless of the tool you use to call the SkyCiv API (for more information about SkyCiv API, visit API Excel Documentation). The interface is designed to be easy to use, clicking the side panel menu allows you to navigate the workbook sheets with ease. The title of each section heading is linked to the API documentation if you need help filling in any of the fields to build your model. Space is provided on the right-hand side for you to make your own calculations. The template has a simply supported beam ready to solve, all you need to do is enter you username and your API key which you can find at https://platform.skyciv.com/account/settings. If you don't have a SkyCiv account yet, you can sign up for free here. For information about getting started and compatibility, visit the API Documentation.